This image of Mercury, returned by NASA's Messenger spacecraft, shows a more detailed view of Mercury's surface. 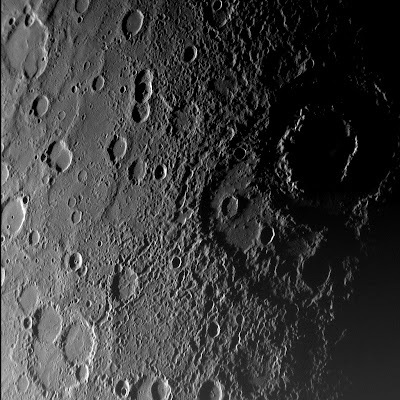 This image was taken from a distance of approximately 11,000 miles, on January 14th, 2008. The resolution of this image is less than one mile, so some craters shown are less than one mile in diameter. The large crater in shadow on the right side of the image is Vivaldi, discovered during the Mariner 10 mission and named after the Italian classical composer of the same name. As more images come back from Messenger, I will most likely add them here, to avoid clutter. An awesome article! The top site features developed the top article. Cheers pertaining to always keeping people current using much critical along with exclusive data. Currently click this Cash Advance Of great help for anyone cheers!